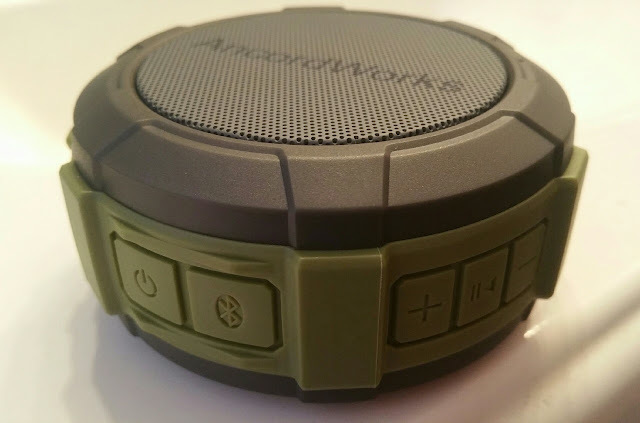 This shower speaker is great for the shower and outdoors. Made of metal and silicone, it is water resistance, shockproof, sandproof and dustproof. The carabiner makes it easy to carry because you can clip it anywhere while on the go, camping, at the beach, hiking, biking, or boating. The built-in MIC and hands-free features, allows you to conveniently pick up a phone call by this portable bluetooth speaker in the car, bathroom, at home or office, or anywhere else you might be enjoying your time. The TF card play feature makes it so that you do not need to carry your smart phone to the bathroom with you, just store your favorite tunes to the 8G TF memory card (included, can store about 1000 songs) with the card reader (included), then insert into the card slot. The all-in-one concept, this stylish, functional and versatile shower bluetooth speaker comes with all the accessories you may need: suction cup/carabiner/USB charger/ 8G TF memory card/ TF card reader/USB Charge cable. (A special thanks to Freewise and Tomoson for sending me this item at a highly discounted price in exchange for social media shares.) All opinions are my own!